Can you confirm these amateur observations of Arthrosaura reticulata? 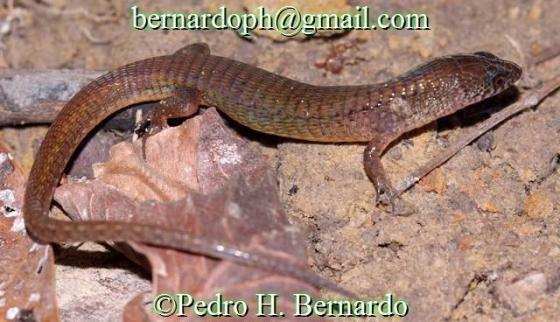 Leposoma picticeps: Type locality: Pebas, Peru. Comment Synonymy: Pantodactylus tyleri and A. versteegii have been considered as a synonyms of A. reticulata (e.g. by PETERS & DONOSO-BARROS 1970). Leposoma picticeps COPE 1886 has been synonymized with A. reticulata by HARRIS 1994. Distribution: Presence in Bolivia unclear; there seem to be no published specific localities (T. Doan, pers. comm.). 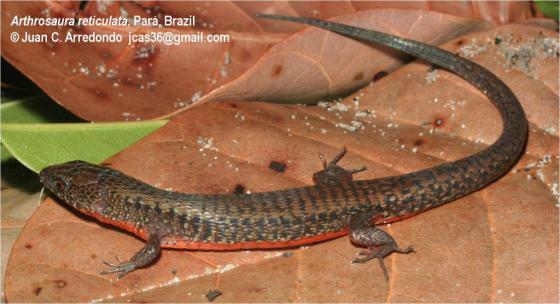 Type species: Cercosaura reticulata O’SHAUGHNESSY 1881 is the type species of the genus Arthrosaura BOULENGER 1885.
da Cunha, O.R. 1967. Lacertilios da Amazonia. III. O genero “Arthrosaura” Boulenger, 1885 (Lacertilia, Teiidae). Atlas do Simposio sobre a Biotica Amazonica 5 (Zoologia): 141 - 170.